Sadly, on October 8, 2013 we lost a friend and founding partner, David T. Greathouse. David was a homegrown Kentucky “hardboot,” whose family-run Glencrest Farm is one of just two commercial nurseries to produce winners of the Kentucky Derby and Kentucky Oaks. Through the years, Glencrest developed a number of significant stallions, particularly Clever Trick and Wavering Monarch. David’s years of bloodstock work had been primarily focused on finding fillies on the track that had the ability to add Graded black type to their records before being resold privately or at auction. David along with Glencrest Farm and various partners focused on pinhooking young bloodstock and properly placing individuals where they realized maximum return on investment and racing partnerships that produced numerous stakes fillies over the years. 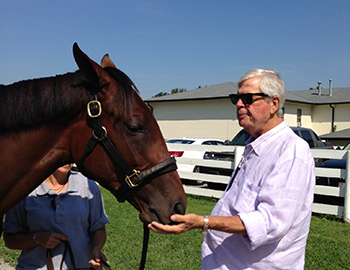 David was a member of Keeneland Association, Thoroughbred Club of America and Kentucky Thoroughbred Owners and Breeders/Kentucky Thoroughbred Association, having served as a past director of TCA and KTOB/KTA.